We have had Hansel and Gretel for 13 years now in Kitty Time. They share everything with each other pretty well and they were from the same litter when we inherited them as kittens. 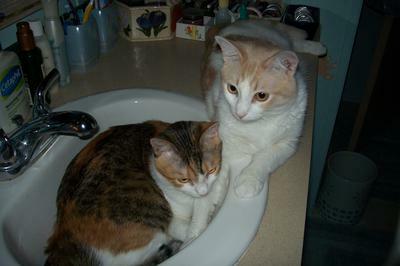 Here they share the sink but not for too long. They are a hoot. How lovely that they got to stay together. They are lovely. They look sooo cute together. Have fun with them.